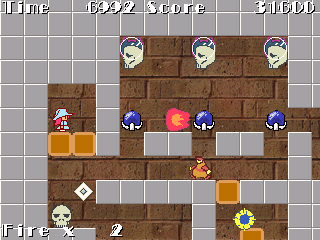 This is a freeware game, available for download with source at Adas’ Linux Game Programming (direct link). Don’t worry kids, it’s still in Windows. 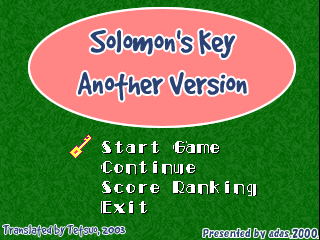 As far as the game goes, well, if you’ve played Solomon’s Key you pretty much know what to expect, as this is just some more levels like Solomon’s Key. 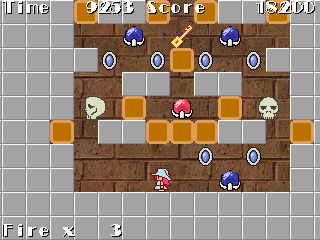 If you don’t know, you’re a girl who jumps around and can make blocks appear with her magical wand, and you can also shoot a limited amount of fireballs. 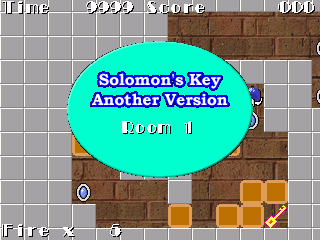 Your goal is to get the key in each level, and then get to the door that is subsequently opened. It’s kind of a puzzle game, but it’s kind of not, since there’s all these stupid enemies that keep destroying the blocks you keep creating. And then they kill you and you start over again. Well, I never much liked the games in particular, but the series apparently has a hell of a following, and this one probably won’t disappoint. On a side note, it would be really nice if you could turn those sounds off. They get kind of annoying. This download here is for the Lite version, which means you use this if you already have the game installed. 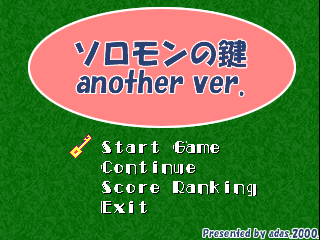 You can go to the SD site and get the Full version, which has the complete translated game. If you wanted to do that. Either way, Tetsuo didn’t have to translate much, just a few bitmaps. But, a translation is a translation, even if most of it was in English in the first place. But hey, the title screen’s cool! Yeah!